A detector is a two-terminal device that is used to rectify an RF signal (like a diode rectifies an alternating current signal in a power supply). Detectors are used as the receiving element in amplitude modulation schemes among other uses. Long before Beavis and Butthead provided wholesome entertainment, Goofus and Gallant were teamed in a magazine called Children's Highlights that your parents would subscribe to if they were afraid that you were in danger of being a juvenile delinquent. Goofus and Gallant predate Frankie Lymon singing the JD song which was a stretch for him and the Unknown Editor alike.... but it is arguable that Frankie was more cuddly and lovable. Goofus and Gallant each build a detector using the same diode. Goofus uses waveguide, Gallant uses coax. Which of the boys achieves a higher voltage for a given RF input power? This is a great question for interviewing a microwave design candidate to put him/her to shame. Today only 1 out of 100 microwave engineers know the answer, back in the 1950's, 90% of microwave engineers would have known as they would have been schooled in the RadLab series. Do you know the answer? Click here when you give up. Detectors have been around since the earliest attempts at the parlor trick of wireless transmission of electrical energy. Marconi's incredible feat in 1902 of receiving a Morse code signal across the Atlantic used what was known as a coherer as the receiver. Coherers are not exactly detectors but perform the same function. The coherer is filled with sharp metal filings, and starts to conduct when a weak RF signal is passed through it, in a process akin to micro-welding. Unfortunately it keeps on conducting after the RF is absent, hence the "decoherer" which repeatedly slaps against it and loosens the filings back to their non-conductive state. The DC current is passed to a pair of headphones, and in a sound-proofed room the operator waits for a ridiculously weak audio signal and writes it down, then solves the message like a puzzle for all of the letters he missed. The coherer below is displayed at the Twin Lights Museum in Highlands New Jersey, site of a 19th century Marconi wireless station. Not long into the history of radio the "cat's whisker" detector was discovered and enabled a million hobbyists to to build a radio receiver, the beginning of the long distance social interaction that everyone seems to think is so new and exciting in the Facebook age. Soon Reginald Aubrey Fessenden figured out how to broadcast voice and music, and an industry was born. A crystal radio is the original example of a true detector; here a crude point-contact diode was used to rectify a AM modulated signal back to baseband so the listener could take the A-train to Harlem with Count Basie over headphones if the room was quiet enough. Early point contact diodes were made from a galena crystal (lead sulfide) and a metallic pin known as a "cat's whisker". Detection by a cat's whisker can be attributed to the Schottky effect. Walter Schottky figured out the physics behind this type of metal/semiconductor junction, and now an annual prize is offered in his name for the very best works in physics. It wasn't long before vacuum tubes took over for crystal detector. Soon radios were produced that had "loud speakers" such that everyone in the room could enjoy a broadcast. Lee De Forest's three-terminal "audion" (patented 1906) became the go-to detector for signal corps efforts during the Great War, at least for the Allied side. The name suggests that De Forest was interested in audio reception for telephony and had no idea about the RF properties of his enormous contribution to mankind (it has to be in the top ten inventions of all time, up there with the wheel and arguably above the transistor as it came first and changed society far more). By 1914, Edwin Armstrong recognized that the audion could be used as an radio-frequency amplifier as well and patented the regenerative receiver (the world's first RF amplifier! ), which created one of the greatest patent battles in history and no doubt contributed to Armstrong's 1954 suicide. 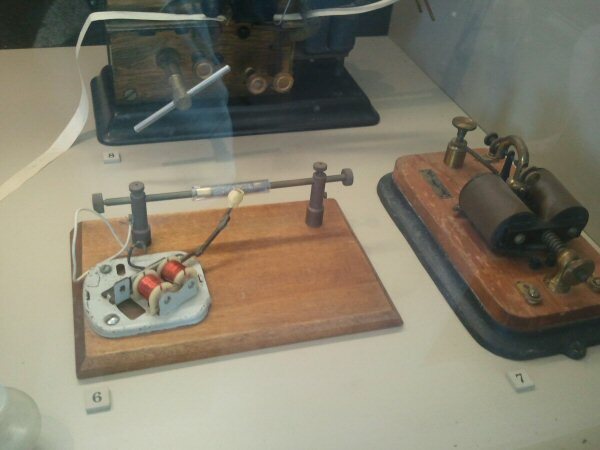 ...don't know whether you ever contemplated it or not but the reason that telegraphy was king for so many years was that by use of a relay they in effect had an in-line amplifier... which audio (the telephone) did not. So they had communications, coast-to-coast, and inter-continental until that famous "audion" was invented. And those early ones were notoriously unstable....they would break into self-oscillation at the drop of the hat. It was only when some smart guy thought to insert a second or third grid (tetrodes and pentodes) between the signal grid and the plate that stable audio and RF amplifiers were finally born. And still, in those early days, if you wanted to make a coast-to-coast telephone call you would so inform the operator, who would tell you to stand by, during which time she phoned from relay station to relay station, setting the individual gains just right (both ways) after which she would phone you and tell you that the circuits were ready. My Gawd!.....now you can use your cell-phone for the same thing.....almost instantaneously. Another interesting feature....right up through WWII the big intercontinental high-powered radio transmitters used power triodes.....all my radio transmitters in Nanking after WWII used these, but we had a tune-up process which we would use, sending a small signal thru these power triodes, and then tweaking a oscillation-preventing feedback capacitor just right, before applying the full power....it worked every time! And except for the output audio amplifier and the all-purpose rectifier tubes my family cabinet radio (RCA) uses triodes (27's) exclusively. Another little item of the good old days....up thru the mid-20-s cabinet radios operated on battery power. There were three batteries available: The "A" battery which powered all of the filaments (usually 6 volts); the "B" battery which delivered 90 volts...you'd use two of these if your set required 180 volts; and the "C" battery which produces whatever bias your control grids required. This last battery had a number of outlets, ranging from 1/2 volt to 4-1/2 volts, each voltage available via those miserable Fahnstock binding clips. And every cabinet radio had a separate shelf for the placement of these batteries. Something else you might be interested in....some smart guy invented a very sensitive RF receiver using a single tube......the Regenerative Receiver. The device had what was called a "squelch" circuit which would periodically turn the single tube on and off, at a rate sufficiently higher than the audio range to prevent interference with the output audio. When the tube was turned on it would build up from noise, heading for self-oscillation, but turned off before it ever got to that level. If the tuner was tuned to a radio station signal this signal would be amplified, since it was well above the noise level. And can you believe it....when Eye was in Boston attending the Harvard and MIT radar schools, Eye saw two of these old one-tube sets for sale in a radio store in Harvard Square....there were no other sets available, what with the war on. Detectors are used to convert amplitude-modulated microwave signals to baseband (or video) signals. Two applications of detectors that are important in your laboratory are power heads (the business end of a power meter, check out our page on power meter measurements) and scalar network analyzers. Using a swept frequency source, a dual-directional detector and a three detectors, and a computer operating a Lab View A/D interface, you can construct a poor-man's scalar network analyzer, and evaluate circuit gain (or loss), as well as port impedance match. You too can open your own Microwave Monster Garage! As you may have guessed, at the heart of the radar detector you use in your car to avoid speeding tickets uses a microwave detector circuit. Here is a schematic of a simple detector circuit. The heart of the circuit is the detector diode, whose non-linear behavior is what causes the "detectitation". Yes we made up that word and no don't use it at a design review. Various types of detector diodes will be described below. The diode rectifies the incident power, providing a signal that is of one polarity (either all positive or all negative) to the bypass capacitor, with an amplitude proportional to the input power level (square-law). For the detector circuit shown in our figure, a positive voltage will be developed. Typical detectors provide a negative voltage, which would occur by reversing the diode in the schematic. In order for a detector to generate a DC voltage, a DC return must be supplied. This is typically done by placing an RF choke (shunt inductor) across the detector diode; at RF frequencies the inductor looks like an open circuit and has no effect, at video frequencies it provides a low-impedance path to ground. A bypass capacitor forms an RF ground for diode. It also is provides what is known as the video capacitance (CV) of the detector circuit. This capacitor determines the upper frequency limit of the video signal's bandwidth (the detector will work down to a video frequency of 0 GHz (DC),which is what happens when your input signal is a continuous wave (CW). The video bandwidth is related to the minimum rise and fall time of the detector circuit, and how short an RF pulse you can detect. At the video frequency, you want the video capacitor to look ideally close to an open circuit. To calculate capacitive reactance on our calculator, click here! The diode equivalent circuit is never a good match to fifty ohms, so some overpaid microwave engineer like you had to synthesize a network that would transform it to something close. Usually a diode that is "turned on" will behave like less than 50 ohms, so an impedance transformer is used to step up its impedance. Below some other terms are defined that you will need to know when you specify a detector. For a certain range of power levels, a detector's output voltage is proportional to its incident power measure in watts. Why is this called "square law"? In "linear" operation, Ohm's Law says that voltage should be proportional to the square-root of power. Thus, in the square-law region, power's relationship to voltage has been squared. The ratio of output voltage to incident power is a constant in the square-law region for detector diode. Units for K are millivolts per milliwatt; a typical detector might provide 500 millivolts per milliwatt. Depending on which way a detector diode is grounded, the video signal is either positive or negative voltage. Most detectors you will find in your lab are negative detectors. If looking at negative voltages on your oscilloscope is making you seasick, push the "invert display" button on the scope! Video resistance is real part of the "dynamic" output impedance of a detector (at its video port). You can't measure this with an ohmmeter, but you can with a voltmeter and a resistor. With an incident CW signal incident on the the detector, find a series resistance that decreases the output DC voltage by half. The video resistance will be equal to this value. The sensitivity of a diode to detecting weak AM signals can be improved by adding just a wee bit of DC voltage to move the operating point slightly closer to forward conduction. Most detectors are not biased; they are referred to as "zero-bias detectors". The previous discussion was on analog detectors, that is, a device that outputs a signal that is somewhat proportional to a power level (depending on whether it is in square-law range). A level detector uses a conventional detector along with a comparator circuit, to create a binary output signal that indicates when a threshold power is exceeded. In order to avoid fluctuating output when the detected signal is near the threshold, hysteresis is often added to the comparator circuit, typically on the order of 0.2 dB referenced to the input power level. Another term used for a level detector is a high power indicate (HPI) circuit. Coming soon: a schematic of a level detector! We've got a good one, but there never seems to be enough time to create figures for this stinking web site! Diodes used in detectors can be Schottky or Esaki tunnel diodes. The two ports of a detector are the RF port and the video port. As a piece of lab equipment, a coaxial detector might have an SMA connector on the RF port and a BNC connector on its video port. BNC cables work great for video signals, provided the bandwidth is only hundreds of megahertz. "Video" is an arcane RF term that comes from television, where signals are broadcast at UHF frequencies. Note that the video port of a detector may or may not contain RF frequencies depending on whether the RF signal is AM-modulated. It will contain a DC term since a detector works by rectifying RF (one side of the sine wave is eliminated).